Film it Now! is a special category reserved for books with such terrific premises they would clearly make hit movies or TV shows. 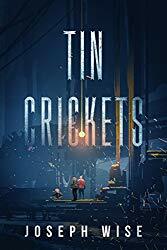 While researching a new YA adaptation, Chaos Walking, I came across this sensational-sounding nugget – Tin Crickets by Joseph Wise. I have not always read the books (yet) that are featured in Film it Now!, but you can bet I’ve added them to my ever growing to-be-read stack. What really caught my eye, first, was the title. I guess I should say what caught my ear. There is something both ominous and futuristic about tin (chemical element) juxtaposed with crickets (nature). Tin invokes a sense of industrialization and machinery while a cricket is a simple, unassuming, innocent creature. This combo piques my interest for sure. The cover was second to catch my attention. Visually there is darkness, solitude, and vulnerability. At a closer look, it may be sparks that pepper the forefront of the cover. Could those, perhaps be the “tin crickets”? Whoa. Then the description is as follows – “Night after night, Tommy Molotov and his friends break curfew. With a 16mm camera and a handful of stolen keycards, they sneak into the restricted sectors of Fallback to film what the City doesn’t want any of its citizens to know. Unsanitary conditions in the hydro farms. Toxins in the water supply. A brutal and unchecked police force. 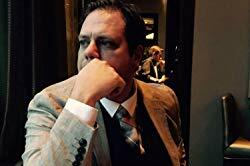 Day after day, Tommy plays his Riot Reels in secret gatherings, hoping the truth will start a revolution. When Tommy and his friends break into a well-guarded research lab and film evidence of a monstrous cover-up, revolution seems closer at hand than ever before. But first they have to get home alive, and with the footage intact. As soon as I’ve read it, expect a detailed review! I only wish I were the one to write the screenplay for this bad boy!